Today I am bringing you an old stand by, Sock It To Me Cake. It makes a great cake to have with coffee but is an equally good dessert. My grandkids all love it. It is moist and easy to make since it starts with a cake mix. But don’t tell anyone, they would never guess. First I would like to share what is going on at my house today. We woke up this morning with the phone ringing at 6 AM. It was an automated call from the school board letting me know that school was cancelled today because of bad roads. Now I don’t know about you, but I love a snow day! My grandkids are old enough to take care of themselves so I just use the day for whatever I feel like doing. Today, I am writing this post for you and then spending the rest of the day quilting. An unexpected day off is sometimes the best thing for us. Time to decompress and just do whatever our hearts lead us to do. Kind of a way to recharge our spirit. When I was a young school girl, my parents would always take off from work one day in the springtime and we would all go fishing. They never told me ahead of time, just woke me up and let me in on the surprise. Now that was a special “snow day”. Whenever we have a really nice day in early spring, it takes me back to all the wonderful memories of those days. Our springtime snow day always included my grandmother and grandfather, mother and daddy and my sister and I. We packed sandwiches for lunch and snacks and drinks. If the fish weren’t biting we played in the edge of the water. The idea that all the other kids were in school made anything we did all that much more special. Those are memories that I will cherish forever. Once in a while when the grandkids I take care of were small their mothers would take off work. They would always call me and announce “snow day for you”. Those words just made my heart sing. I immediately started going over all the housework I could get done but then caught myself and put all that aside. A snow day is for playing whether in the snow, the river, or the sewing room. It is always important for us to take a few snow days along the way. I try to always have something fun ready to do at a minutes notice. If I have to run one of the grandkids to practice I don’t want to waste the time when I could be stitching or reading. I have my tablet with tons of books loaded on it. I also have cross stitch in progress in a bag . If I am hand sewing quilt blocks or embroidering them, I have a kit ready to just pick up and go. Even if you don’t have a entire snow day, a few snow minutes works just fine. Always have something that you are interested in all packed and ready to just pick up. You will be amazed at how just a few minutes away from everyday stress revives you. I’ll get off my soapbox now. I have a quilt waiting to be bound and a couple of quilt backs waiting to be put together. Just remember to take a snow day every now and then. Your spirit will thank you! Now for our Sock It To Me Cake. Our roster of ingredients for our cake is Yellow cake mix, Oil, Dark brown sugar (you can also use light brown), Sour Cream, Sugar, Eggs, Water, Pecans, Cinnamon, and Vanilla. 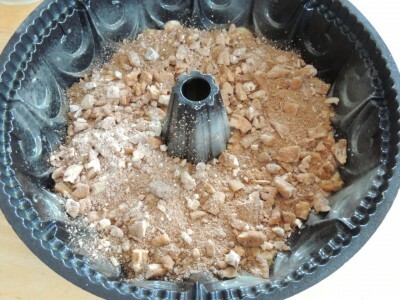 Streusel mixture: Place 3 tablespoons of cake mix, brown sugar, cinnamon and pecans in a small mixing bowl. Stir until well combined and set aside. 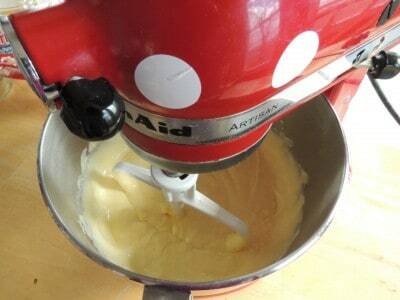 Put remainder of cake mix, sour cream, oil, water, sugar, eggs, and vanilla in large mixing bowl. 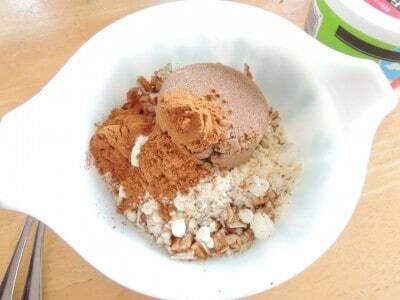 Blend with mixer for 1 minute, scrape down sides and continue mixing for 2 more minutes on medium speed. Batter should be thick and creamy like this. 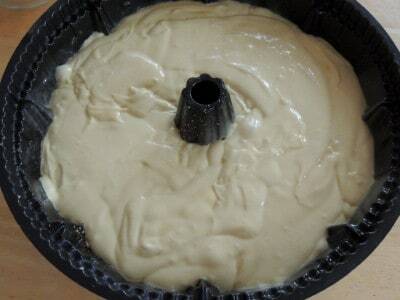 Pour half of batter into a greased and floured bundt pan. Sprinkle streusel mixture over cake batter. Pour remaining cake batter over the steusel mixture and spread gently to the sides of pan. Bake this at 350 for 50-55 minutes. Let cool in pan about ten minutes before turning out to cool completely. Now we need to make our glaze. Our glaze ingredients are confectioners sugar and milk. 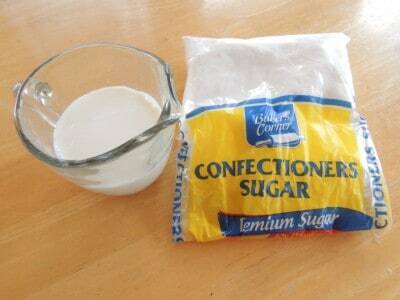 Place confectioner’s sugar in a bowl and add milk a tablespoon at the time while whisking. Add enough milk to make a glaze thin enough to drizzle over the cooled cake. Christy’s note: If you want your glaze to just be a drizzle on top and soak into the cake some, make it thinner. If you want your glaze to really sit thick atop the cake like icing, you want it to be the consistency of school glue. If it gets a little thin, just add a tablespoon or two more of sugar. A little thick, a tablespoon more of milk. 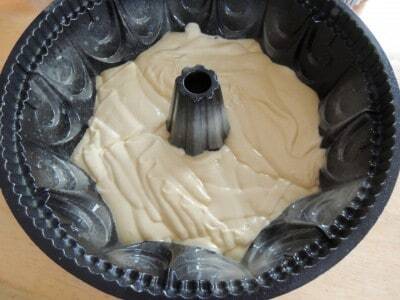 Grease and flour tube pan or Bundt pan. Set aside. For struesel filling, place 3 tablespoons cake mix, brown sugar, cinnamon and pecans in small mixing bowl and stir until well combined. 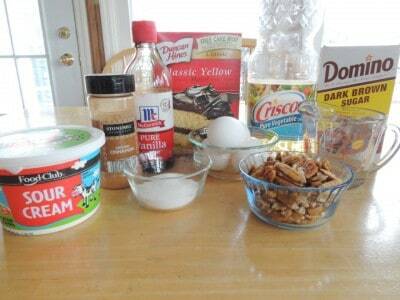 Place remaining cake mix, sour cream, oil, water, sugar, eggs, and vanilla in large mixing bowl. Beat one minute with mixer and stir down sides. Continue beating two minutes on medium speed. Pour half of the batter into prepared pan. Pour remaining cake batter over struesel and spread gently to sides of pan. Place in oven and bake for 50 to 55 minutes or until golden and cake springs back when lightly pressed with your finger. Let cool for 10 minutes and then turn out onto rack to cool completely. 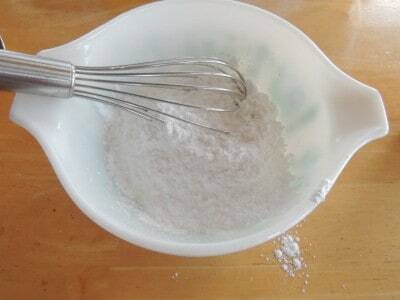 Place sifted confectioners sugar in small mixing bowl. Add milk, 1 tablespoon at a time, and whisk until smooth. More milk can be added if needed until glaze is thin enough to drizzle over cake. Isn’t she a beauty? I think she is worthy of a bakery case. And the great part is, she tastes equally amazing. I’d love to hear how you’d spend your ideal snow day in the comments! 10 Great Casserole Recipes To Add To Your Collection! I remember my Mother making this cake when I was still living at home it was always a hit with 6 kids it did not last long. I just made this cake a few weeks ago. It was one of my granny’s favorite cake to make. My girls loved it. This is a great cake to bake when you want to bake something to have on hand and to give to someone to brighten their day. The serving plate and cake server caught my eye. They are absolutely beautiful. Beautiful dishes like these are my weakness. Thank you Mama Janice for reminding us that it is okay to have a “snow day” and make memories. Hey Miss Janice! Thank you so much for the reminder to take time to refresh our spirits! I love the idea of having something ready to “pick up” and go with. And your cake serving set is gorgeous! I’ll have to make this recipe when my boys come for a visit. Thanks for sharing–have a great week! I have a question…now that they have downsized the amount in a boxed cake mix-how do you make that up? I have noticed that in using a 9×13 pan that they don’t really come out as high. Can’t wait to try the Sock It To Me…looks yummy! Thanks so much! Which brings to mind, WHOSE bright idea was it to start packaging sugar in four pound bags? I don’t know, but it is frustrating isn’t it Alan? I know you’re onto something, MB! I noticed the difference in cake mixes back in 2012 while on vacation- smaller, flatter cakes- and a change in texture. Less ounces in each box saves money for the manufacturer but our cake pans are the same size. I started making my own mixes- based on recipes online that I tried. I measure and dump the dry ingredients in a ziplock bag, seal and store. 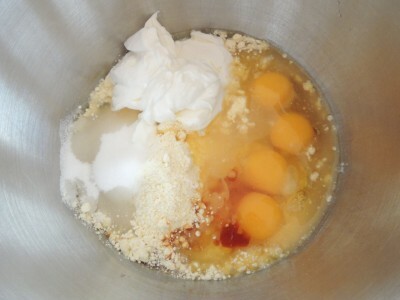 Then when I’m ready to make a cake I add the mix and liquid ingredients into a mixing bowl and mix it up. Not every recipe works well, but King Arthur flour has one that has become my “go to” recipe for chocolate cake mix. Unfortunately, I’m still searching for the right recipe for a yellow cake mix. Since most yellow cakes are butter cakes, it’s more complicated than that chocolate one that you simply add eggs, oil and water. What a great idea for making and storing your own “mixes”. I stay away from cake mixes but when I do use them, my Pure Mexican Vanilla always goes in it so it does not taste like a box cake. Is the chocolate cake recipe on the bag of King Arthur flour? Thanks for the idea! I think some people add a few tablespoons of flour to make it bit larger. Mix well. Add 3 ounces (or 6 tablespoons) to a 15.25 ounce cake mix. No other increases in ingredients necessary. I don’t remember where I got this from, but it works well for me. You could also store an extra boxed cake mix in a jar and use 6 tablespoons from it when you make a cake. I have a Duncan Hines Classic Yellow Cake Mix that is 16.50z. I used to make my Sour Cream Streusel Cake with the 18.50 oz. D.H. Classic Yellow Cake Mix and it was fabulous. Can you please tell me how many Tablespoons of extra cake mix or your recipe of flour, sugar, baking soda & baking powder I would need to increase to the 18.50oz? Would it be 2 T. or more? I am so angry that the cake mix companies – Duncan Hines, Betty Crocker & Pillsbury have all changed their cake mix sizes & formulas. The cakes don’t taste the same and they don’t bake up the same as before. I do add vanilla, sour cream or buttermilk depending on the recipe. Just not the same. Some of the best recipes were made with the older sizes of cake mixes. What is more annoying is that when I wrote to the companies they just ignored my emails. So much for “Customer Service”. I realize you aren’t asking this of me but I just wanted to chime in that both my mother and myself haven’t modified our cake recipes at all and they all still turn out wonderful, despite the size change. Thank you for your quick reply. When I recently made my Sour Cream Streusel Cake with the smaller box mix size, it came out much denser that before the reduced size box. I bake in a gas oven, so I’m not sure if that has any bearing on the baking process. Before moving I baked in an electric oven. I’ll try the recipe again with the added cake mix to make up the 18.50 oz. and see if that makes a difference. Recently joined your recipe site and look forward to trying your recipes. Thank You for your comment on the cake box sizes. I was just going to ask the same question. I have refrained from baking several older recipes because of the difference in the box weights. Now I won’t be afraid to try them again! You are so welcome!! Don’t be afraid to give those older recipes a try! Unfortunately, I do not have a Bundt pan. Could I use a regular cake pan , either square or oblong? Good Morning Cheryl! That is a great idea and great price!!! I will have to start checking there and see what I can find. The locally owned Flea Markets are good sources to find cake pans, bundt, angelfood, etc, at reasonable prices. I have my original heavy aluminum avocado green, non- stick Nordic Ware bundt pan and have bought every kind of pan made by Nordic Wear, I think. I plan to give them away or pass down. Flea Markets or Goodwill stores are the greatest places to find beautiful-one-of-a-kind plates to serve your cake on or to give away, also, usually for a dollar each. Fabulous idea! I find cake plates at G.W. and garage sales. For friends, I will bake them a birthday cake and tell them to keep the cake plate. What timing! Today is my son’s 1/2 birthday. He’s 16 1/2 and so we’re going to make this cake for him. 🙂 We’re wishing for snow but making do with more rain so you gotta celebrate even the half birthdays. With a snow day, I’d probably catch up on my mending/sewing projects although I’ll probably do that anyways. lol With homeschooling and usually being done by 12 or 1, we are blessed to be able to have abundant free time on a normal day. My favorite thing to do on a snow day is cook or bake. I remember the first thing I ever baked on such a day…..it was Popovers for Piglet. The recipe was in a Winnie the Poo cookbook that I got from the library when I was little. My mother helped me with the measuring and pouring. Thanks for making me think of this. I would like to pass along what I do about the smaller cake mix sizes. I found this recipe on line. Mix one and a half cups flour, one cup sugar, two teaspoons baking powder, and one fourth teaspoon baking soda. Add two ounces of this mixture to a 16.5 oz cake mix to make the old 18.5oz cake mix. I keep this in an air container and use it when needed. I may have to make the Sock It To Me Cake today, looks really good. Thank you for all your stories and recipes. I rarely get snow days we don’t even get freezing cold days. But when I get those days, I do things I like, read, bake sew, sometimes watch tv. I also do some geneaology that can take hours figuring out if someone is the right person or just a similar name. John being a common name, along with George, and having several generations in the family with those names being used by multiple brothers honouring fathers and grandfathers. I think one set of three brothers all had a John, George, and a Mariah in their families, all of them within a year or so of the other. What a delicious sounding recipe! Planning to try it as soon as I pick a cake mix up at the store. Speaking of mixes-I don’t comment or apologize about using them because I don’t bake very often and that mix is gonna be way fresher than if I start with my own flour that basically gets pulled out for chicken or gravy every so often. That being said I don’t just mix a cake up and serve it. I do feel the need to improve on them but they’re a great starting point aren’t they! What a beautiful cake! That cake plate and server is also beautiful. May I ask what the pattern is? Thank you. I love Southern Plate! Everything you and Mama do just makes my day! Hi, how are you? I remember my mother used to bake this cake & had it for us after school I could not wait to get home. We all had to walk a mile to an from. I walk so fast that I souned like a flying bird lol. But since my mother is in heaven I for sure will try yours. Thank your mom. God Bless. Recently I made this cake for my husband, who is diabetic, using the new sugar free yellow cake mix, splenda brown sugar, and no fat sour cream — the cake was DELICIOUS! My husband doesn’t have a sweet tooth – fortunately – but once in awhile something just hits the spot for coffee time or dessert!! This is a recipe that is easy to change, and still tastes great! 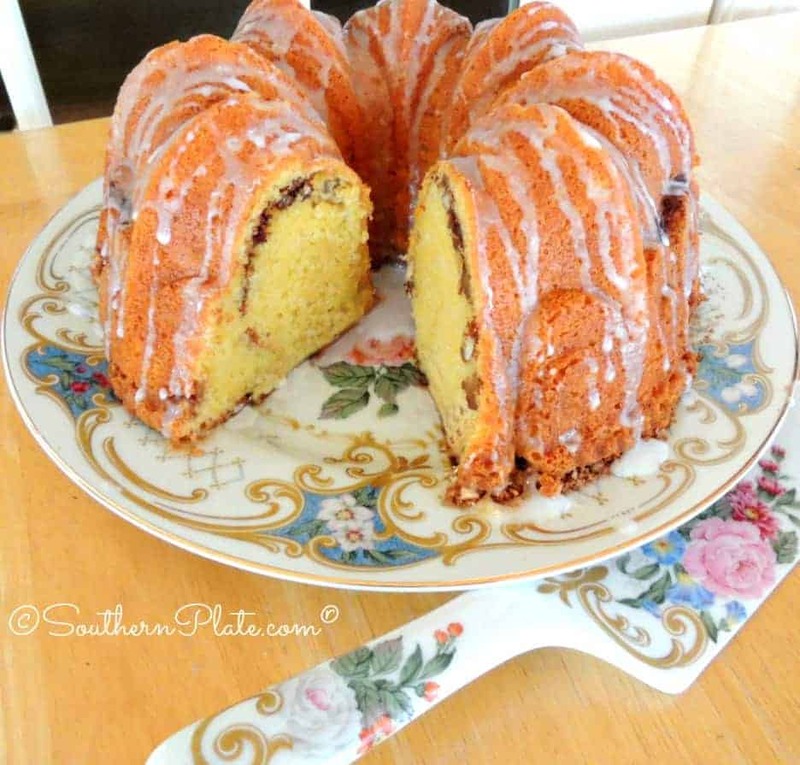 Thanks for sharing your “fishing days” story — we used to keep our boys home when they were young, and called them “lovey days” …………..
Mama Janice: Seeing this recipe brought back lovely memories of my friend Betty whose Sock-it-to-me cake was the best ever. She always had the ingredients in her kitchen and the recipe memorized and could bake a cake at a moment’s notice! To the comment about the cake mix sizes being different … I just bought a Duncan Hines cake mix and noticed that the Sock It To Me cake was again on the box. The recipe remained the same, so it probably means that the small amount of mix doesn’t make any real difference. The phrase, “sock it to me” came about in the 1960’s, it was “hip talk” meaning you were up for whatever the subject may be, i.e, hit me, bring it on. The TV show Martin & Rowan’s Laugh In brought into our living rooms every week with people saying it. I so remember Sock It To Me Cake! My Mother had done that forever! Like you Ms. Janice, I keep a tote bag with a project to go, mine has crochet in it! I usually cook and bake on snow days. Hi, the cake looks like it will be one I will try for my housefull of teens! Our children are such encouragers. Whatever we fix seems to be better than anyone else’s. Nobody can cook like my mom either. Not even me. No matter how exactly I follow her recipes. Now my kids think that about me. :). I love your recipes! Just good,plain,country cookin. Good Morning Dana!!! It sounds like your house is the place to be…and I think that is the best compliment there is!! Would you believe, I was planning to look for this recipe tomorrow? My best friend and I made this in the 70’s- her birthday is next week- it’s going to be her birthday cake. Oh my goodness, what perfect timing!! I hope you and your friend have a wonderful day celebrating her birthday!!! Thank you for sharing your great memories and this great recipe! It’s always sew nice to “meet” a fellow quilter – like you, I always keep a little project packed & ready to go at a moment’s notice, along with my NOOK and the gazillion books it holds for my reading pleasure! Can’t wait to make this cake for the grands – thank you again! Peg, it sounds like you and Mama would get along perfectly!! I hope your grands enjoy the cake!! I love “Snow Days” and am now planning to add a few “Snow Minutes” to my crazy life. Thank you For your sweet thoughts. May I ask a question? How did the outside of this cake become orange? I was hoping some one else would ask this question, but I did not find it once in comments! 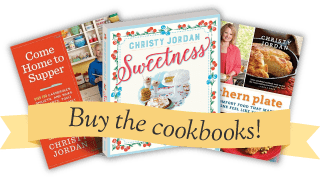 Ideal snow day,,,cozy in the kitchen making recipes from Southern Plate while my husband sniffs around the kitchen saying “Is that a Christy recipe, when can we eat?? ?” Christy’s Mama- thanks for your post – you are a lovely lady! Now back to the kitchen, tonight we are having your Baked Mac-n-Cheese! Miss Christy, your cake is much higher than mine is. What size bundt pan did you use and the brand? Wow! this Sock It To Me Cake looks delicious, haven’t tasted one since potluck days at work,one of my co-workers Donna, would always bring a Sock It To Me Cake. Thanks for the nice recipe! My grandmother was a nurse in our small town hospital when I was growing up. This is one of the recipes she came home with, and everyone had to try. I also remember the 7 Up cake about that time. And they were always good! We also watched Laugh In, though looking back, it and Hee Haw were both a bit “racy” at the time. Times, they were a changing. Look where we are now!